When Leonard Silk began his career as a journalist post-World War II, most business publications simply provided their readers with economic data and statistics. The information was neither newsworthy nor particularly interesting to read. Silk changed all of that by bringing more of a personal approach to coverage of the economy. He wrote in layman’s terms so that his readers could more easily understand news from the business world. Silk was born in Philadelphia on May 15, 1918. He began his career as a reporter while in college at Wisconsin, where he edited Octopus, a humor magazine. 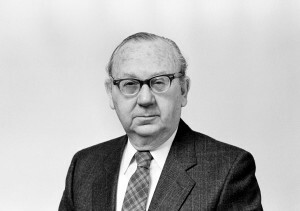 It was here that he encountered professors who argued that economists should focus not only on the big picture, but also on the effects of the markets on individuals. From there, in 1940, Silk continued to Duke University to earn a Ph.D. in economics, a rare feat for a journalist at the time. Following the war, Silk used this degree to become an economist for the United States Mission to the North Atlantic Treaty Organization. It was after this stint that Elliott Bell, Business Week’s new editor, hired Silk to head the economics section of the publication. Silk worked here from 1954 to 1969 and preferred to hire journalists who, like himself, had a background in economics. “He was brought into Business Week with the idea that businessmen needed to be brought up to speed on the Keynesian revolution, and that if they simply subsisted on The Wall Street Journal, they wouldn’t know what they needed to know to get along in a new economy,” said Mark Silk. A year after leaving Business Week, Leonard Silk went to work for The New York Times as a writer of economic columns and editorials. He worked there until retiring in 1992. One way that Silk got people into the paper was by profiling economists themselves. Silk also managed to find time to author a book, “The American Establishment,” which he co-wrote with his son Mark. It was published in 1980. Silk died in 1995 at the age of 76. Caroline Schaberg is a native of St. Louis, Mo., and a senior business journalism major in the Class of 2013 at the University of North Carolina at Chapel Hill. She interned for Bloomberg News in New York City last spring.